SAN SALVADOR, El Salvador--In 1937, a year after Juan Chong arrived in San Salvador from Hong Kong and opened the Canton China Bar and Restaurant, an American journalist dropped in for a drink. "You American?" he asked. The reporter nodded. "You know something? You're the first American journalist to come in here since 1937. You work for New York World, too?" "The Chicago Tribune," the reporter answered. "The New York World died a long time ago." "You come to write about the war, right?" Chong asked. The reporter nodded again. ''There had been some trouble just before that other reporter showed up," Chong said, recharging his memory cells with a shot of vodka. "Some peasants up north had shot a couple of soldiers. There was talk of another rebellion like the Matanza." (The Matanza, or "slaughter," had occurred In 1931 and 1932, when some 32,000 men, women, and children were killed by government forces after an ill-fated uprising by the Trotskyite Indian named Farabundi Marti). "We were all very excited about It, Chong said, igniting an ancient pipe. "But this American journalist, he was not. He said Americans didn't care about little revolutions in little countries." Then, eyeing the reporter before him, Chong said, "I guess Americans think differently now, eh?" Besides a well-stocked bar, where foreign correspondents tend to gather evenings in clusters to discuss (well, argue) solutions to El Salvador's problems, the Camino Real offers a government-run telex room for filing stories and messages. It is not just camaraderie and the dubious benefits of flock journalism that lure journalists to the Camino Real - It Is safety. "This is the hotel for the International press," explained William, the head bellhop. "Neither the left nor the right would be so stupid as to attack this hotel. This is neutral territory." Yet most journalists feel a little naked In El Salvador. 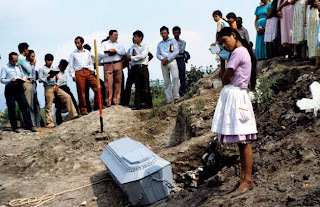 Since the fighting began in 1980, five foreign correspondents and photographers have died - not to mention the two dozen or more El Salvadoran journalists who have been tortured or murdered. Conversations in the Camino Real bar tend to be sprinkled with bravado and twists of gallows humor as reporters attempt to put such things out of their minds the way they have always done in war. 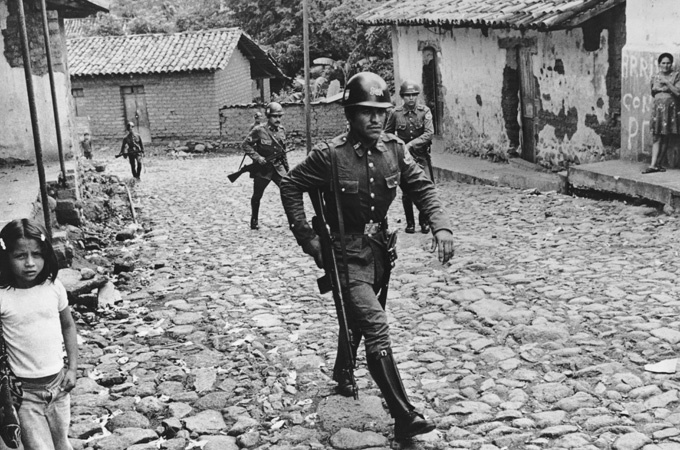 But there does seem to be something about El Salvador's tragic conflict that makes you look over your shoulder a lot. Perhaps it's that there are so many fanatic fringe elements in this New Jersey-sized nation of five million running around flaunting machine guns, machetes, and machismo. Right-wing death squads armed with razor-sharp machetes and rifles roam the city streets looking for "subversives. Left-wing guerrillas blow up somebody's house or place of business just about every night. And out on the streets, you learn to examine every car that passes you for the barrel of a rifle or pistol pointed at your belly. "I don't think El Salvador has ever been more unhealthy," said Chong, relighting his pipe. "People don't come in my place after 8 at night anymore because they are afraid somebody is going to throw a bomb through the door. People are scared. I've never seen them so scared." "When I left China, it was during the Japanese occupation of Manchuria," he said. "The war was terrible. I wanted to find a peaceful place to live, so I came to Central America. What a mistake. Of course, I'm too damned old now to care. But sometimes when I see bodies in the streets with their heads chopped off, I think I should have stayed In China."